I created a "Boo." Have you? I decided to try out Audioboo today. I noticed it allows you to create a 3 minute audio recording. I recorded myself describing the game "Count Out Three." Make sure to hear my boo below. If you like audiboo, you can ask your parent to sign you up. It is free, and it is great if you want to record an interview, great sound, music you made, radio show, or a report. You can practice storytelling or just create a boo to let your friends know what you are up to! Just record the audio and share it OR just save it for the future. What are some additional ways students can use audioboo? Have you ever created a boo? Let me know what you think of audioboo, and if you do create a boo, please share the boo by posting the link in the comments section below. That looks cool but I can't hear what you made. That's really disappointing to not hear what you made. 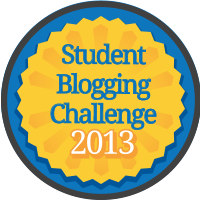 I love your 2013 blogging challenges, such great ideas - may have to get my students onto this too.